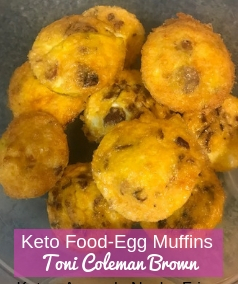 This bacon and egg muffin recipe is delicious, quick and easy to make and is the perfect Keto Food because it has only 1 gram of carbs. Cook the bacon on medium heat until nice and crisp. (If you cook them on high heat the bacon will burn, so take your time and cook them nice and slow), Turn the bacon often to cook them evenly. Once the bacon is cooked use a paper towel to remove any and all access bacon grease. Then let cool. Once cool, crunch bacon up into pieces, then add to a mixing bowl, combine the cheese about 3 oz (or more if you desire it) and eggs. Mix the ingredients together and pour them into the muffin pans that have been sprayed with cooking spray. The one word to describe how you will feel after eating these muffins is full. You will feel satisfied after eating one which is approximately 2 eggs with cheese and a few pieces of bacon. You may want to eat more than one, but it’s absolutely not necessary. People who are following the Keto plan must be mindful of their macros and their daily calorie intake. It’s easy to overeat while following the program but if you keep a food journal it can help. What Other Egg Muffin Recipes Should You Try? The best thing about this recipe is the fact that you can add just about anything to egg muffins. So what I would tell you to do is to be creative. You can add spinach, onions, sausage, broccoli, red, green peppers, ham, mushrooms and so much more. You name it and you can add it. There are so many options. 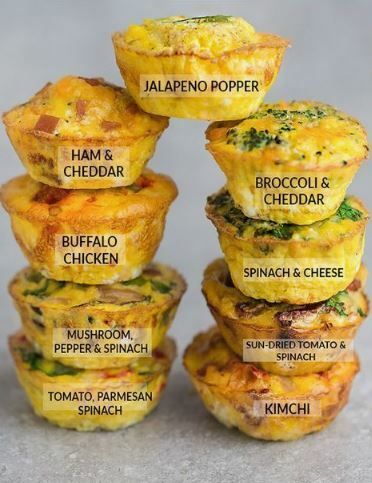 The only issue you may have with the many different options of egg muffin recipes is trying to keep them low carb. When you add tomatoes they are higher in carbs. You must avoid any foods that will throw you out of ketosis. It is very easy to drop down in ketone levels. I had to learn this the hard way. 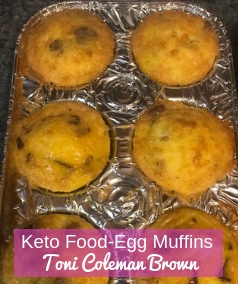 My journey into the Keto Lifestyle has me trying a variety of recipes like the bacon and egg muffin recipe and so many more. I have been on this lifestyle journey for about 7 days and so far all of the recipes that I have tried have been good and satisfying. None of them have left me feeling hungry or out of whack. The one thing that I always hated about low carb and low fat diets was the fact that they would always leave me feeling hungry. Especially Weight Watchers. Every time I went on the Weight Watchers plan I would always gain back all of the weight, this is why I am turning this into a lifestyle. I am not saying that I will never have certain foods again because that’s not sustainable. But what I am saying is that I am going to follow this lifestyle and monitor my ketones. I know that when I cheat my ketone levels will drop, but I do know exactly what it takes to get right back into the ketosis state. If you would like to more keto recipes a great place to start would be Keto Daily. 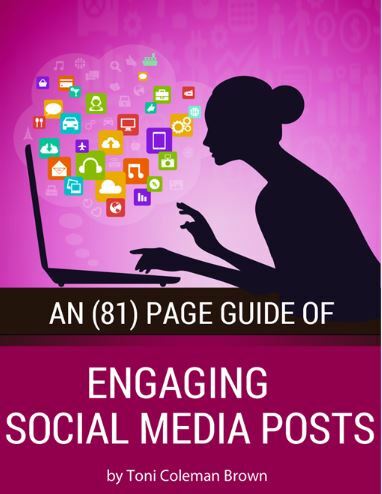 They have awesome recipes for breakfast, lunch and dinner. You could get lost on that site with all of the options that you can try. But like every recipe I would advise you to follow the recipe but also make it your own. Add your flavor to it. If you don’t like one ingredient, replace with something that you love. I would also say to switch things up a bit because eating the same thing over and over again will get you bored fast. But starting it off with recipes like this bacon and egg muffin recipe is a home run. Follow me on by Keto Lifestyle journey by subscribing to this blog. Simply click the button below to subscribe. It is truly my belief that anyone can have success getting lean by following the Keto Lifestyle. Simply start where you are and don’t quit.